Find your next home or condo by downloading the WB Group’s app for smartphones and tablets. Our app is easy to use and allows you to look for new listings quickly and easily, whether you are on the go, or relaxing at home. When you open the app, you will start with the main menu. 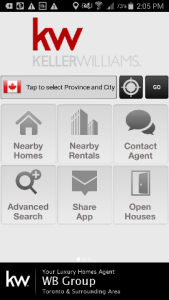 From here, you can navigate to nearby homes and rentals, which will show you the latest listings in your specific geographic area, contact agent, which allows you to email or call the WB Group directly, the advanced search, share the app with others and discover new open houses in the area. At the top, you will find a search box, allowing you to search anywhere geographically. Advanced search is easy and allows you to find what you are looking for… fast! You are able to pick from different parameters including: min. price, max. price, beds, baths, home size, lot size, distance, property type, open houses, price reduced and new to market. 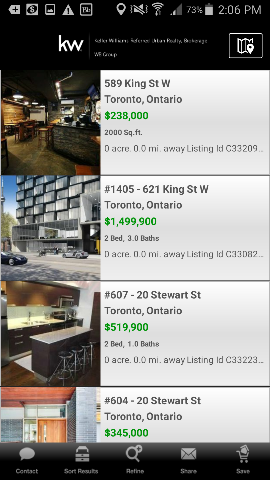 When you select nearby homes or rentals, the app will show you the closest and newest listings in your area. You have the option to contact WB Group to arrange a viewing, sort results, refine your search, share a listing with someone or save the listing to view later. 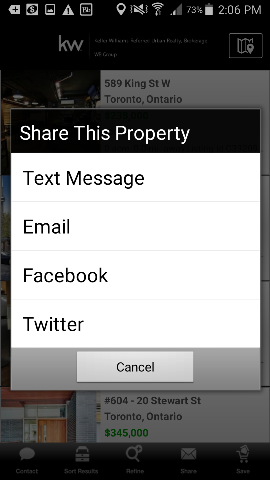 If you see a listing you like, you can share the property to anyone via text message, email, Facebook or Twitter. 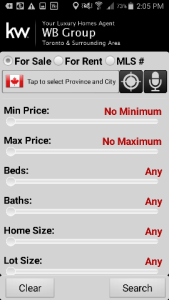 Download the app and start your real estate search today!